My list included some material items that would be difficult for me to part with, and it included some people I would hate to lose from my life. But I also included intangible items such as my image and reputation (what people think of me), and my ambition (wanting to finish my career well and to publish a book), contentment within my marriage, my agenda and my plans (particularly my rigidity over my agenda and my plans), and my health (the ability to do the things I enjoy). I included these items in my list and wondered what it might be like if I would have to give them up. Wow! Since that assignment many of those items have been seriously challenged. With such challenges, comes a good opportunity for me to discover whether I trust in God on the basis of things being pleasant for me or whether I trust in God because He is still worth clinging to even when everything else seems to fall apart. One of the things stirring up the struggles I am presently facing are faults and failures and character flaws from my past that come back to bite me. “Regret is inescapable in a world of imperfection, failure, and loss. But can there also be redemption? Can a life gone wrong because of loss be made right again, however irreversible the loss itself? Can people with regrets be set free and transformed? I believe that there can be redemption, but only under one significant condition: People with regrets can be redeemed, but they cannot reverse the loss that gave rise to the regrets. People can be changed by the unchangeable losses they experience. Thus, for redemption to occur, they must let go of the loss itself and embrace the good effects that the loss can have on their lives. They must somehow transcend what lies behind and reach forward to what lies ahead, directing their energies toward changes they can make now. In other words, they must seek personal transformation, which comes only through grace…. “If I want transformation, I must let go of my regrets over what could have been and pursue what can be…. “Many people are destroyed by loss because, learning what they could have been but failed to be, they choose to wallow in guilt and regret, to become bitter in spirit, or to fall into despair. While nothing they can do will reverse the loss, it is not true that there is nothing they can do to change. The difference between despair and hope, bitterness and forgiveness, hatred and love, and stagnation and vitality lies in the decisions we make about what to do in the face of regrets over an unchangeable and painful past. We cannot change the situation, but we can allow the situation to change us. We exacerbate our suffering needlessly when we allow one loss to lead to another. That causes gradual destruction of the soul. I find in myself the inclination to become discouraged and to feel defeated and to slide into a shell or a hole. But Sittser’s words challenge me and encourage me to grieve the losses I experience due to the faults and failures of my past but not to cling to my regrets. His words encourage me to cling to God’s grace instead and to look for how God may transform me through it all—even if it involves more loss for me in the present or future. I was thinking recently about how much I get held back from becoming all that God would have me to be and from all that I would like to become. I got to thinking about the insecurities that get in my way, and the fears that cripple me, and certain habits that drag me down. As I thought about it, I realized how I tend to react to life often with the mindset of a trained elephant. 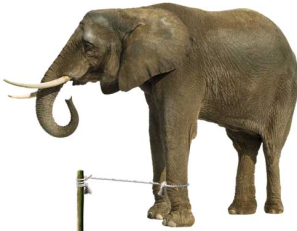 I once read about a circus elephant that had a rope tied around one of its legs, but the rope was not attached to anything. Someone asked the elephant handler why the elephant did not run away since the rope was not tied to anything except the elephant’s leg. The handler explained that while the elephant was growing up, the rope was attached to a spike in the ground, and the elephant would try with all of its strength to pull against the spike but could not gain its freedom. After a while the elephant got used to the containment of the rope and stopped trying to get away. After that, the handler was able to remove the rope from the spike. It was enough just to have the rope tied around the leg of the elephant. I am beginning to realize that what often holds me back from becoming all that I can be and experiencing life more fully is the mindset of a chained elephant. To put it differently, what often holds me back from becoming all that I can be and from experiencing life more fully is a lingering sense of shame. I would add that the most important thing I can do is to keep taking to heart God’s love, claiming it for myself, and sharing it with others.